Drumnadrochit Car Park says NO! Incredibly, the main car park in Drumnadrochit says NO to everyone. 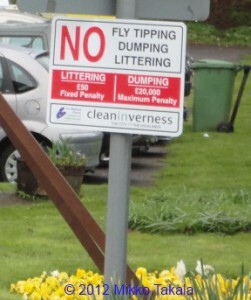 Visitors arriving at the tiny Loch Ness side village are shocked to find a sign threatening them upon entry and quoting fines of £5000 – £20,000 (6000 – 24,000 euro) for leaving litter. There is tremendous speculation and chatter around Loch Ness as it has been announced that the enormous skeletal remains of a carnivorous dinosaur have been found in Beauly, Ross-shire. “Beauly is only 10 miles or so from the village of Drumnadrochit on the shores of Loch Ness and the historic discovery of a beast like this – living and hunting nearby further proves that Nessie – the world famous monster – must exist”. We know that the village is full of old dinosaurs from a bygone age that still manage to stalk about causing trouble but this takes us back millions of years into an even more dog-eat-dog jurassic world. You can read more about this staggering discovery in The Inverness Courier.